TD Bank and SunTrust Bank robbery suspect. Surveillance photo is from TD Bank. Bank robbery suspect, James C. Collier captured. 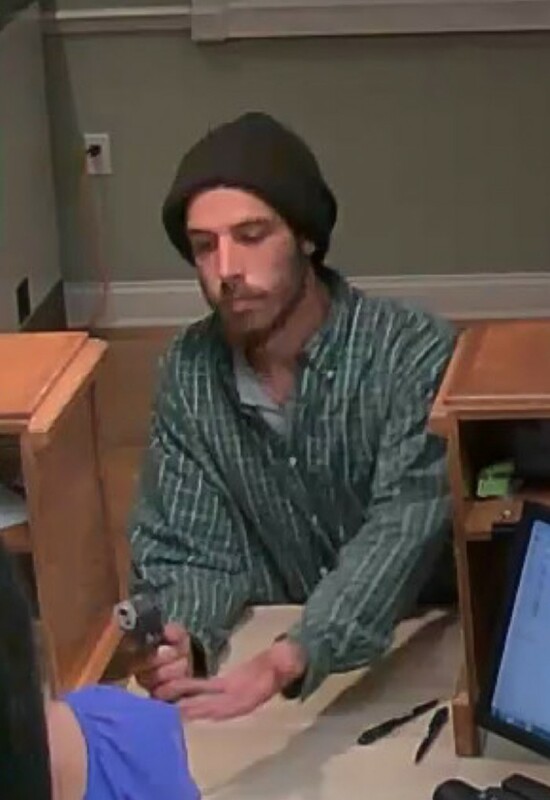 Ocala, Florida — Ocala Police said two banks were robbed within hours. On Friday, at approximately 9:20 a.m., the TD Bank, located at 2437 Southeast 17th Street was robbed at gunpoint. 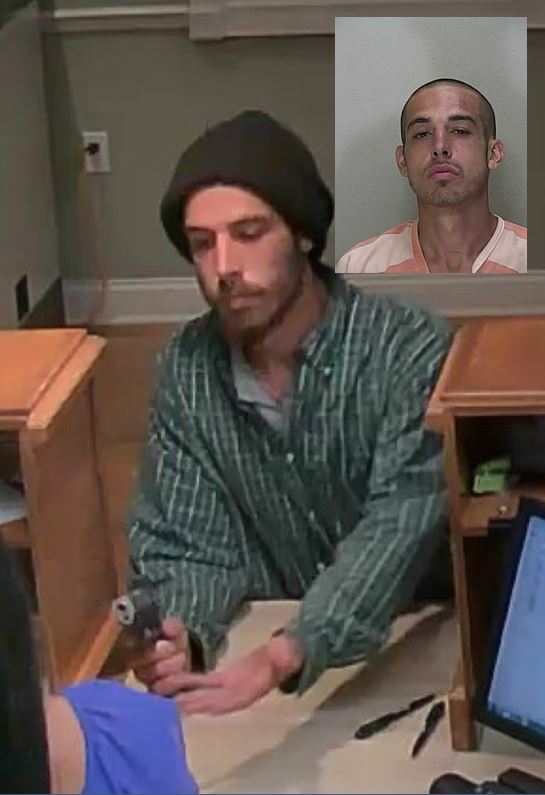 According to Ocala Police, a man, later identified as James Christian Collier, entered the TD Bank and gave one of the tellers his identification, which had his name on it. The teller told police that Collier wanted to inquire about “his account” with the bank. However, when she typed in Collier’s personal information into the banking computer there wasn’t any information about him in the system. Collier then gave the teller his Social Security Number. According to reports, the teller again told Collier the system did not show anything, at which time he asked for his identification back and left the bank. Moments later, Collier re-entered the bank and approached a different teller. The teller told police that he pulled a gun and motioned with his free hand for her to hand over the money. Once she handed Collier the cash, he ran from the bank. Then, at 11:25 a.m., the SunTrust Bank in the 3500 block of State Road 40 was robbed. According to reports, Collier handed the teller a note that was written on the back of a deposit slip. According to reports, the teller handed Collier some cash and he fled the bank. Investigators said that while they were investigating the SunTrust robbery a witness approached them. The witness told investigators that someone with a gun had entered a Kangaroo gas station earlier in the day. According to reports, just prior to the robberies Collier had gone into the Kangaroo and asked for a job. When he was denied he told the clerk that he might be forced to “do something crazy.” The clerk said Collier then motioned under his clothing and pointed out that he had a gun. The clerk said that when she saw police responding to SunTrust she followed them so she could tell them what had happened. The clerk positively identified Collier as the man who had entered the store. At approximately 3:30 p.m., Collier was caught trying to break into a motor home located in the 4900 block of East State Road 40. As officers approached Collier, he fled on food. Collier was chased and caught by a Marion County Sheriff’s K-9. As the K-9 attempted to bite Collier, he began striking the K-9 with closed fists. Collier was then tased and taken into custody. Collier was charged with Robbery with a Firearm(x2), Possession of a Weapon by a Convicted Felon, Resisting Arrest, and Public Order Crimes/Striking a K-9 Police Dog. He has previous convictions for Burglary, Fraud, Grand Theft, Dealing in Stolen Property, Reckless Driving, Drug Possession, Larceny, Falsifying Pawn Broker Forms, Defrauding a Food Establishment, and multiple Violation of Probation arrests. Collier’s bond was set at $120,000. Police said Collier was in possession of $1,600 at the time of his arrest. Thomas Gaines, the father of one of the tellers, told Ocala Post that his daughter was really shaken up after the robbery.